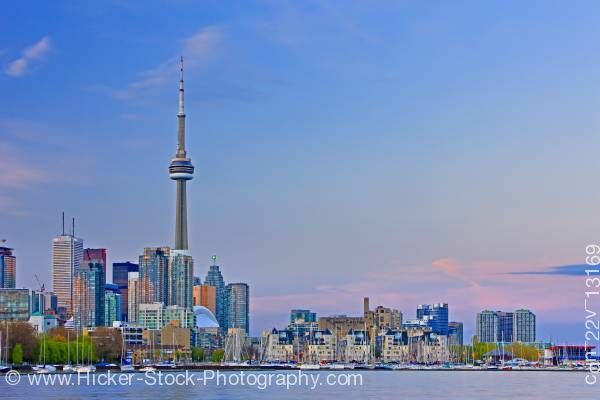 Stock photo of Toronto's waterfront skyline with a pink sunset showing above the smaller buildings on the right side of this scene. The upper sky is still blue, with the CN tower and other skyscrapers easily identifiable in this beautiful scene. This stock photo the City of Toronto's skyline as seen from Ontario Place, Toronto, Ontario, Canada at sunset. This wide view include much of the city's skyline, with the CN Tower being by far the tallest structure in this scene. The majority of the background is blue sky, but the sun is setting and the lower right portion of sky to the right of the tower is pink. With 2.6 million residents, Toronto is the 5th largest city in North America. One-quarter of Canada’s population is located within 160 km (100 mi.) of the city and more than 60% of the population of the USA is within a 90-minute flight.